According to the United States Department of Agriculture (USDA), a "food desert" is an area in the United States with limited access to affordable and nutritious food, particularly an area composed of predominantly low-income neighborhoods and communities. A G.I.V.E. Garden supplements a family or individual's diet with fresh vegetables and herbs and encourages fresh air and gardening exercise. G.I.V.E. 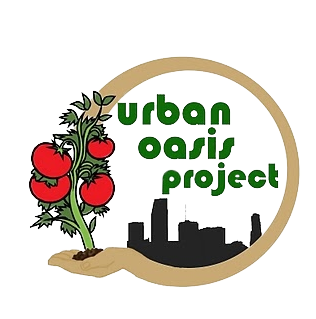 gardens began in April 2009 when a family living in a food desert wanted Urban Oasis to teach them how to make a food garden. The mother had a new baby on the way, the father was working long hours in retail, and the 4-year-old daughter was very excited to grow vegetables to eat. Their learning time was limited, and instead of teaching with just words and diagrams, we decided the best way to learn was by practice. With a handful of volunteers and donated materials, the first G.I.V.E. garden was planted with a lot of hands-on learning for the recipient family. Since the first G.I.V.E. garden was planted, many more have arisen, teaching recipients who then inspire others and teach their neighbors to make their own gardens (often without our help). Hundreds of volunteer hours have been donated from people with a lot of expertise (Master Gardeners) to people with no experience. Can you or your business sponsor an entire home garden for $300? Want to help volunteer and build with us? Contact us to find out how! Make a donation to support our programs with the Paypal button below!